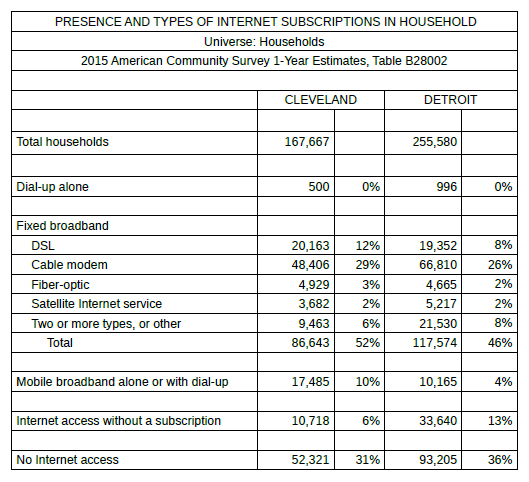 More than 50,000 households in Cleveland and more than 90,000 in Detroit had no Internet access of any kind in 2015, according to the Census’ newly released American Community Survey. The Census says “Internet access without a subscription” covers community wifi access and Internet in college dorms. But the category may well also include mobile access purchased without “subscriptions”, like data cards from Wal-Mart or Target. Among households that do have Internet access, the cable companies — Time Warner in Cleveland and Comcast in Detroit — are the biggest providers by far. AT&T’s DSL service holds a distant second place in both cities.